Corresponding author. E-mail address: xuyi@sit.edu.cn (Y. Xu). Abstract: The immobilization of acetylcholinesterase (AChE) on amino functionalized SBA-15 mesoporous sieves (NH2-SBA-15) was explored for detection of organophosphorus and carbamate pesticides. Several methods have been studied and the "adsorption-crosslinking" is found to be the best one. Firstly, AChE and bovine serum albumin (BSA) were adsorbed in turn on the surface of NH2-SBA-15 by electrostatic adsorption, and then glutaraldehyde was added for cross-linking the amino group of AChE. The NH2-SBA-15 showed around 95% immobilization efficiency and the specific activity of immobilized AChE (AChENH2-SBA-15) reached 130% relative to free AChE under optimal immobilization conditions. It was found AChE-NH2-SBA-15 retained 94.0% and 82.8% of its initial activity after 60 days at 4℃ and 25℃, respectively. It remained 55.0% of its initial activity after 6 times recycling. During the detection of pesticide, the AChE-NH2-SBA-15 showed wider linear range and much lower limit of detection compared with free AChE. The current method showed good recovery (93.8%-109.3%) and low RSD (< 5%) for both standard solution and real vegetable samples of Carbaryl and Trichlorfon. It was believed that AChE-NH2-SBA-15 could be exploited as a fast, sensitive and low-cost biocatalyst towards the detection of pesticides residues which could be stored at room temperature for a long time. Organophosphorus (OPs) and carbamates as pesticides are widely used in modern agriculture . But they are highly toxic substances, which can cause adverse effects to human health through the transmission of food chain, resulting in malignant diseases . Acetylcholinesterase (AChE) is mainly found in cholinergic neurons and can catalyze hydrolysis of acetylcholine into choline and acetate rapidly. And the enzyme is inhibited by many organophosphorus and carbamate pesticides, such as trichlorphon, carbaryl and carbofuran . Thus, fast, sensitive and cost-effective detection of pesticide residues is essential to assure the quality of environmental and food safety. The free AChE has some disadvantages with high-cost expenses, poor stability, can only be stored at -20 ℃ and be used only once. Immobilization of AChE on carrier is an effective method to solve the existence problems. Various materials have been developed for enzyme immobilization, including magnetic particles [4-6], metallic/metallic oxide nanoparticles [7-12], carbon nanotubes and hybrid carbon nanotubes nanocomposites [13-15], inorganic membranes [16, 17] and others [18-20]. Although they have high sensitivity and precision, most were made into sensors and stored at 4 ℃. The products of pesticide residue detection, which were sold in domestic markets at present, had the defects of low sensitivity and needed to store at low temperature. If the immobilized AChE can be very stable at room temperature, the application area for pesticide residue detection reagent will be extended with a lower cost of transportation and storage. Therefore, it is very essential to develop a stable detection reagent with high precision and sensitivity, which can be stored at room temperature for a long time. Mesoporous silica materials with its inherent characteristics of high surface area pore volume, tunable pore size accommodating dimensions of enzymes, and mechanical stability, has been regarded as a proper vector for immobilizing [21-25]. The enzyme, AChE, had been already immobilized on calcined mesoporous silica materials [17, 26, 27], and almost all of them were prepared into a sensor, which was required a lot of energy during the calcinations process, and the preparation of immobilized enzyme were quite complicated even which could only be stored at low temperature. Ethanol refluxing is another way to remove the template of the as-synthesized material, and moderate amount of the template is benefit for immobilizing . Compared to other silica materials commonly used, functionalized mesoporous silica SBA-15 molecular sieve has the advantage of preventing the enzyme leaching from the carrier and increasing the activity of the enzyme, which is arising from the strong electrostatic interaction between the enzyme and the surface of the supporter [26, 28-32]. To the best of our knowledge, no report was found for the immobilization of AChE on functionalized SBA-15. In this article, the SBA-15 and NH2-SBA-15 mesoporous molecular sieve was explored as immobilized supports of AChE for the detection of pesticides residues. 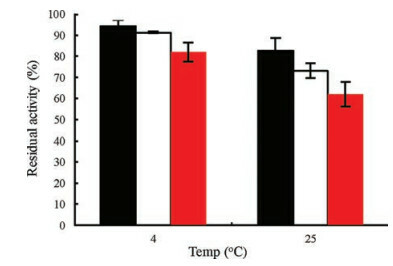 In order to obtain a stable, facile immobilized enzyme that can be stored at room temperature, the optimum immobilization method and condition of AChE were investigated. The properties of immobilized enzyme were also explored respectively. The application of immobilized AChE in the detection of pesticides was also investigated and compared with free AChE. Highly ordered mesoporous SBA-15 was synthesized according to the literatures [27, 33] by hydrothermal synthesis using triblock copolymer P123 as a template and TEOS as a silica source in acidic conditions. The surface of SBA-15 was modified by amino group via refluxing of APTES and TEOS (1:10, molar ratios) in dry toluene at 110 ℃ for 24 h with stirring under N2 atmosphere. Product was washed with dichloromethane and dried in vacuum. The obtained sample was labeled as NH2-SBA-15. The immobilization of AChE on SBA-15 or NH2-SBA-15 was performed in two methods. Covalent coupling method: In each experiment, 10 mg/mL NH2- SBA-15 reacted with 1.5 mmol/L of glutaraldehyde for 2 h at 30 ℃ in PBS (0.1 mol/L, pH 8.0), and the suspension was mixed with 1 mg/mL of AChE solution for another 30 min. The immobilized enzyme was separated by centrifugation, washed with PBS and suspended with 0.4% BSA for another 30 min. Finally, the immobilized enzyme was obtained by centrifugation, washing and rinsing, and labeled as NCC for NH2-SBA-15 immobilization of AChE by covalent cross-linking method. Adsorption-crosslinking method: In each experiment, 10 mg/mL NH2-SBA-15/SBA-15 was mixed with 1 mg/mL of AChE solution in 0.1 mol/L phosphate buffer (PBS) at pH 8.0 for 30 min. Then, the immobilized enzyme was separated, washed and suspended with 0.4% BSA for another 30 min. After centrifugation and washing, glutaraldehyde (final concentration, 1.5 mmol/L) was mixed with the immobilized enzyme for 2 h to achieve covalent cross-linking. Finally, the immobilized enzyme was rinsed three times with PBS and labeled as NAC/SAC respectively for NH2-SBA- 15 immobilized AChE by adsorption-crosslinking method and SBA- 15 immobilized AChE by the same adsorption-crosslinking method. The experiment process of vegetables was modified by the literature  as follows: Fresh vegetables were chopped after washing, then 2.0 g of each sample was sprayed with 1 mL 1 ×10-4 ppm trichlorfon and 2 ×10-3 ppm carbaryl, respectively, and keep at room temperatures for 4 h before using. The sample was extracted by adding 9 mL of 0.1 mol/L PBS of 8.0 and treated with ultrasonic for 5 min, then tested by Microplate Reader in NAC after the suspension was separated by centrifugation. The SBA-15 and NH2-SBA-15 were characterized by XRD, TG-DSC, FT-IR, XPS, TEM and N2 adsorption-desorption isotherms. Mesoporous silica is an easily fabricated material that has a tremendously high ratio of surface area to volume, making it an ideal material for enzyme immobilization. The XRD patterns of the SBA-15 and NH2-SBA-15 materials in Fig. S1 (Supporting information) show the presence of the three reflection peaks at 2θ = 0.8°–2° corresponding to 100, 110 and 200 planes, which indicates that the samples have a highly ordered hexagonal P6 mm structure. The square ratio of 2θ is about 1:3:4 and the presented structure is consistent with the previous report . The textural properties including BET surface area, pore diameter and pore volume of NH2-SBA-15 together with SBA-15 were calculated by N2 adsorption-desorption isotherms, and the results were shown in Table S1 (Supporting information). The pore diameter of the materials is larger than the molecular dimensions of AChE , showing that the mesoporous materials are suitable to immobilize AChE. In addition, the sample was set in thermal analysis apparatus and TG-DSC curve (Fig. S2 in Supporting information) was collected. The amounts of amino group into the pores of SBA-15 were estimated to be 2.76 mmol/g. Fig. S3 (Supporting information) shows the FT-IR spectra of the support materials and illustrated that amino had been modified into SBA-15 [37, 38]. The XPS and TEM results further confirmed the mesoporous structure of SBA-15 and NH2-SBA-15 (Figs. S4–S6 in Supporting information). Immobilization of AChE on NH2-SBA-15 was conducted by the method of covalent coupling or adsorption-crosslinking as shown in Scheme 1. The effect of enzyme/material ratio on the immobilization was investigated by varying the concentration of AChE from 0.5 mg/mL to 35 mg/mL in the presence of support material concentration (10 mg/mL), and three kinds of materials were tested, including SBA-15 (pore diameter is 6.1 nm or 12.5 nm) and NH2-SBA-15 (pore diameter is 10.2 nm). For SBA-15, with the increasing of the enzyme/material ratio, the amount of immobilized enzyme increased linearly until it reached the dynamic balance between adsorption and desorption. The maximum adsorption amount of AChE reached 85 mg/g (protein/material) for SBA-15 (6.1 nm), 250 mg/g (protein/material) for SBA-15 (12.5 nm) and 55 mg/g (protein/material) for NH2-SBA-15 (10.2 nm), which meant that bigger pore diameter of SBA-15 was more suitable for enzyme immobilization. A possible explanation is that AChE could be entrapped into both inside of the channel and the surface of the materials and the functionalized SBA-15 restricted the protein coming into the channel. However, the protein immobilization efficiency of AChE on NH2-SBA-15 (>95%) was much higher than that of SBA-15 (60%). NH2-SBA-15 showed the highest immobilization efficiency, being very likely due to the increase of electrostatic interactions, and there was no enzyme leakage. In addition, the specific enzyme activity reached the maximal value at low concentration of AChE addition (1 mg/mL). And the highest specific activity of immobilized AChE was 30%-40% higher than that of the free one, pointing towards a higher affinity between all the active-site groups and substrate. Therefore, 1 mg/mL of AChE and 10 mg/mL NH2-SBA-15 were chosen as the optimal enzyme amount and carrier for immobilization. In order to improve the properties of immobilized AChE, adding certain stabilizing agents is necessary, like BSA, which was frequently used . Fig. S7 (Supporting information) demonstrated the effects of BSA concentrations on the activity and stability of AChE-NH2-SBA-15 prepared according to NAC, immobilized enzyme test was performed in 0.5 mol/L PBS solution of pH 8.0 at 50 ℃. It can be clearly seen that high residual activity of immobilized enzyme was obtained at 0.4% of BSA concentration, but quickly declined as the concentration varied. Therefore, 1 mg/mL AChE and 0.4% BSA were added in turn on the surface of 10 mg/mL NH2-SBA-15 by electrostatic adsorption for 30 min independently, then glutaraldehyde was added for cross-linking with 2 h, is regarded as the optimal immobilization condition. The reusability and storage stability of immobilized enzyme are two of the most vital features in practical application, primarily due to its commercialization demands that enzymatic process should economically reduce cost. Fig. S8 (Supporting information) showed the recycling results of three kinds of immobilized AChE. For NCC and SAC, 44% and 45% residue activity were found after being recycled for 6 times, respectively. However, it gave the 55% of initial activity for NAC. This result was comparable to that of AChE immobilized on porous silicon . The storage stability of the lyophilized immobilized enzyme, which was stored at 4 ℃ and 25 ℃ was investigated. As shown in Fig. 1, NAC retained 94.0% and 82.8% of its initial activity after storage at 4 ℃ and 25 ℃ for 60 days. The results were significantly improved compared with the previous reports [16, 41, 42]. It indicates that this immobilization method can retard the aggregation or denaturation processes of enzyme. There is a strong possibility that AChE in the pore of NH2-SBA-15 is very good to retain the structure and conformation. Furthermore, they cannot be altered as freely as they are in solution because the pore sizes are close to the size of AChE molecule. These results illustrated this proposed immobilized enzyme could be stored with longer time at room temperature, which not only could conserve energy but also be easy for reusing. The application of NAC (AChE-NH2-SBA-15) was examined by different pesticides. It is well known that organophosphorus and carbamates pesticides inhibit AChE activity. Hence, immobilized AChE can be used for detecting various pesticides and its inhibition is directly related to the amount of pesticides . Figs. S9 and S10 (Supporting information) showed the effect of concentrations of inhibitors on the activity of AChE-NH2-SBA-15. The carbaryl curve gave a linear relation for the range 1.0 × 10-3 ppm to 10.0 ppm. Similarly, the linear relation of trichlorfon is 1.0 × 10-5 ppm to 1.0 ppm. The limit of detection (LOD) obtained for carbaryl and trichlorfon were 7.6 × 10-4 ppm and 2.4 ×10-6 ppm, respectively. As for free AChE, the linear range of carbaryl is 5.0 × 10-3 ppm to 5.0 ppm, and trichlorfon is 1.0 × 10-3 ppm to 1.0 ppm, furthermore the LOD is 2.0 × 10-3 ppm for carbaryl and 9.0 × 10-4 ppm for trichlorfon (Table 1). It can be seen from results that the immobilized AChE has higher sensitivity, wider linear range and lower LOD than free AChE. The detection of pesticides residues on standard pesticide solution by AChE-NH2-SBA-15 was conducted 7 times for the same sample, and 3 times on real vegetable sample for the calculation of relative standard deviation (RSD), respectively. It can be seen from Table 2, the current method showed good recovery (93.8%-109.3%) and low RSD (< 5%). Therefore, this proposed immobilized AChE can be regarded as a promising reagent for pesticide residues detection of real samples. In summary, a simple, effective adsorption-crosslinking method has been developed to immobilize AChE on mesoporous NH2-SBA-15 molecular sieves. The NH2-SBA-15 showed 95% immobilization efficiency and the specific activity of immobilized AChE (NAC) reached 130% relative to free AChE. The immobilized AChE also showed good reusability and high storage stability. Furthermore, using carbaryl and trichlorfon as model compounds, the immobilized enzyme exhibited a wider linear range, lower limit of detection than free AChE for the detection of pesticides. And the accuracy and precision is also good for determination both of the standard solutions and real vegetable samples. In a word, the AChE immobilized on NH2-SBA-15 is a promising reagent towards pesticides residue detection for its fast, sensitive, stable and lowcost characters. This work was supported by the National Natural Science Foundation of China (No. 21303105) and Shanghai Committee of Science and Technology (No. 13430503400). Supplementary data associated with this article can be found, in the online version, at https://doi.org/10.1016/j.cclet.2017.10.033. D.Y. Zhao, P.D. Yang, N. Melosh, et al., Adv. Mater. 10 (1998) 1380-1385.